Palo Alto, Calif. March 7, 2017 – Artec 3D, a developer and manufacturer of professional 3D hardware and software, today unveiled Artec Leo, a first-of-its-kind smart device and one of the fastest handheld 3D scanners in the world capturing data at up to 80 frames per second (FPS). Building on last year’s release of Autopilot – an AI-based feature within the Artec Studio 11 software that automatically processes raw 3D data into high-quality 3D models, Artec has achieved a major industry milestone by creating a 3D scanner that can autonomously collect and process data onboard, without connecting to a tablet or computer. On Artec Leo’s multi-touch, half HD screen, the user can watch their object being digitized into a full-color 3D model in real time, which makes the scanning process simple and intuitive. 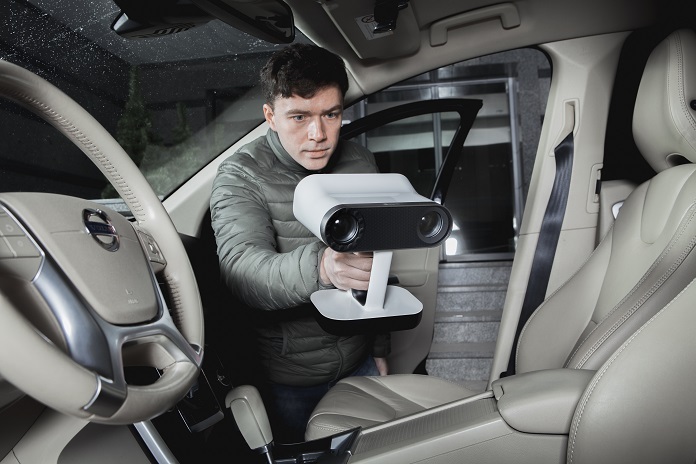 The built-in battery pack, ergonomic grip, and balanced design of the 3D model scanner allows for easy wireless operation and access to hard-to-reach locations. Artec Leo features a comfortably large field of view and impressive 80 FPS 3D reconstruction rate, making scanning large objects or scenes a straightforward task. At the same time, users can bring the scanner closer to particular areas of interest in order to pick up intricate details with a 3D point accuracy of 0.1 mm. This makes Artec Leo perfect for digitizing a wide range of forms and sizes, from a small mechanical part to a large forensics scene. 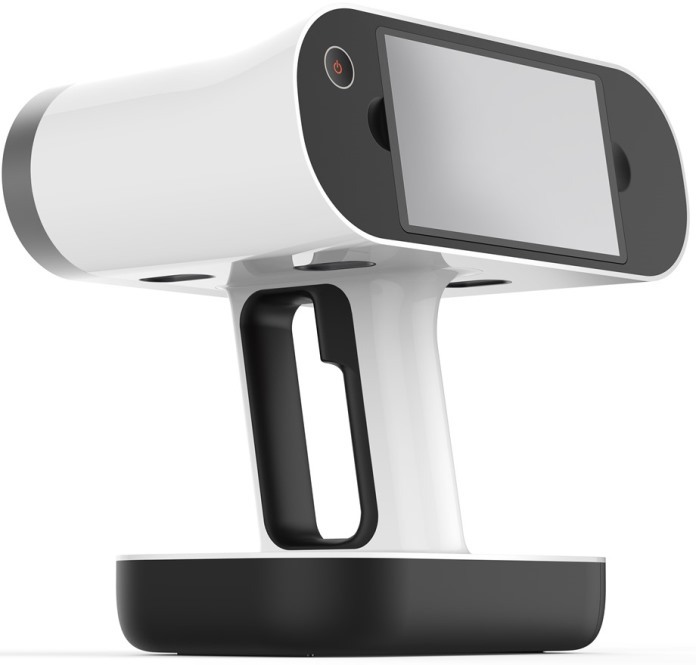 With a custom engineered ergonomic design, this tetherless portable 3D scanner feels very natural in the hand, offering an unrivaled user experience. Built on the state-of-the-art NVIDIA® Jetson™, Artec Leo is the smartest and most powerful 3D scanner on the market, capable of processing large volumes of 3D data onboard. The scanner also includes a 9 degrees of freedom (DoF) inertial system (accelerometer, gyro and compass), which provides precise information about its position and environment. This enables the device to understand the difference between the object being scanned, the surface it is on and the wall behind it so that it can automatically erase the unwanted data. Utilizing a cutting-edge proprietary two-in-one optics system, with a 3D camera and color camera combined as one, Artec Leo can achieve unparalleled precision in texture mapping at a resolution of 2.3 mp. High-quality geometry is also achieved, thanks to the use of a disruptive VCSEL light source, which allows for capturing objects in bright, outside conditions – an environment which is generally unconducive to 3D scanning. Additionally, this advanced technology has allowed Artec 3D to create a flash system that can be adjusted based on the surrounding light conditions for enhanced 3D capture. This also enables users to scan in 3D HDR, making it easier to capture tricky objects, such as those that are black or have shiny areas. While the scan can be seen on the Artec Leo’s screen, it can also be streamed to other devices, such as tablets or laptops. This is a useful feature for those times when a large screen could be helpful or for collaborative work. The scanner has a built-in SSD drive to store 256 GB of captured data, while micro SD cards can be used to extend the capacity of the device, something which can be especially handy for field conditions. Additional battery modules can also be purchased for unlimited 3D scanning in areas with no available power supply. Once scans are completed, data can be uploaded to a computer via a Wi-Fi or Ethernet connection, or directly to the cloud. Artec 3D is an international company, headquartered in Luxembourg, with subsidiaries in the United States (Palo Alto) and Russia (Moscow). Artec develops and produces innovative 3D solutions and products. Artec has a team of professional experts in the collection and processing of 3D surfaces as well as biometric facial recognition. Artec’s products and services can be used in many industries, such as engineering, medicine, media and design, entertainment, fashion, historic preservation, security technology and many more.